Emerging towards the end of the 20th century, Godspeed You! 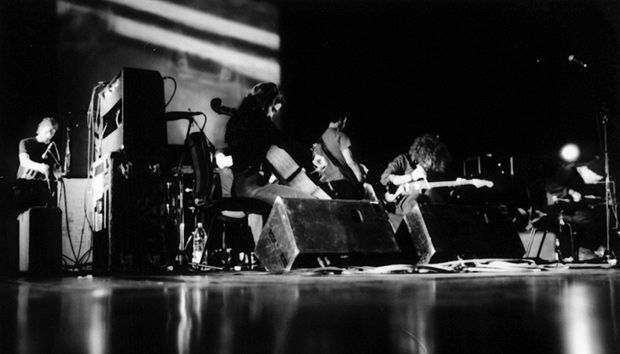 Black Emperor combined the anxiety of the 'slacker' movement with a layered, orchestral musical complexity. Their resistance to the machinery of the music industry and a gentle yet profound pessimism about capitalism lent them an outsider status, even as their gigs became legendary for their intensity. At its most passionate, a Godspeed concert offered an almost spiritual transcendence. Their reformation in 2012, after nearly a decade's hiatus, does see the band continue in the same vein. Melancholic and majestic, the extended instrumental workouts evoke ruined landscapes, delicate hopes and wild abandon: the ferocious drumming driving a triple guitar attack that is by turns ecstatic and elegiac. Favourites from the earlier albums are paraded in full glory, hurling a desperate, wailing electric celebration of noise into the plush environment of the Playhouse, and conjuring memories of the first tours. If the band begin and end on a high, the energy drops when they present their newer numbers. Against the rambling, erratic structures of the first albums, their latest material is plodding and conventional – the influence of Pink Floyd and Michael Gira's Swans is too evident, and the repetitious riffing replaces nuance with a thundering beat. For a band so determined to be independent and bold, these tracks are pompous, derivative and dull. Fortunately, they switch back to the past for the finale. The subtle theme and variation on a motif that sounds like an old hymn allows the band to combine percussive power and lyricism, gradually rising towards the inevitable white noise finale. While these moments of brilliance go some way to justifying the band's reformation, the nagging sense that their newer material betrays a lack of musical ambition suggests that even Godspeed You! Black Emperor are playing the nostalgia card. Reviewed at Playhouse, Edinburgh, run ended. Cult Canadian stately sonic sculptors.